Latex-free. 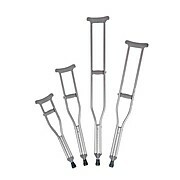 Features push-button adjustment and patient height scale printed on the crutches for fast, accurate fitting. Includes underarms pads, handgrips and tips. Wing nut adjustment for hand grips. 350 lb. weight capacity.